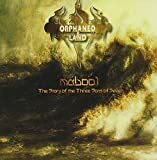 ORPHANED LAND OF TEMPTATION BORN LYRICS"
All that is left now is to cry and ask my God now - "Tell me why ?" Deserted and alone I am forever orphaned !!! All Orphaned Land - Of Temptation Born lyrics are property and © copyright of their respective owners. All Of Temptation Born lyrics provided for educational purposes only.